The horrific murder of Jordanian pilot Moaz al-Kasasbeh has generated shock and outrage around the globe. And if recent history is a guide, this brutal act will only deepen opposition to ISIS, and to violent extremism more generally, in Jordan and other predominantly Muslim nations. At the Pew Research Center, we’ve been asking questions related to extremism on our international surveys for over a decade, and what we’ve generally found among Muslim publics is that support for extremism is low, while concerns about it are high. Even before ISIS’s battlefield victories and humanitarian atrocities began capturing international headlines last summer, we found growing worries about extremism in the Middle East. For instance, 62% of Jordanians said they were concerned about Islamic extremism in their country in our spring 2014 poll, up from 54% a year earlier. There were also increases in Lebanon, Tunisia, Egypt and Turkey. The survey also found mostly negative views toward al Qaeda and other extremist groups in these and many other predominantly Muslim countries. The most positive rating for al Qaeda was in the Palestinian territories, where 25% had a favorable view of the terrorist organization. One pattern we’ve seen in different parts of the world is that the more people are exposed to terrorist violence, the more they reject it. Jordan is a good example. 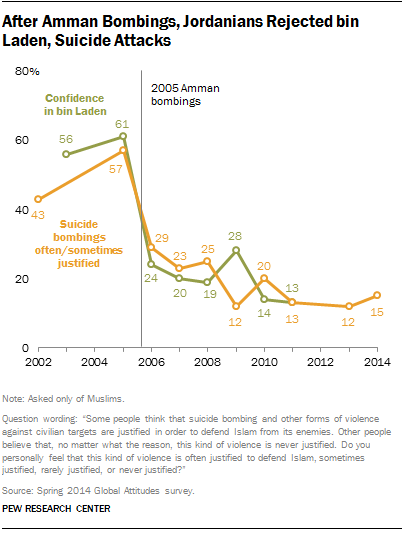 Early in the last decade, Jordanians expressed relatively high levels of support for suicide bombing and confidence in Osama bin Laden, but this changed after the November 2005 suicide attacks on three hotels in Amman, Jordan’s capital. The bombings, which killed dozens and wounded more than 100, were orchestrated by an al Qaeda affiliate, led at the time by the Jordanian Abu Musab al-Zarqawi. A few months later, a Pew Research survey found the percentage of Jordanian Muslims saying suicide attacks can often or sometimes be justified had fallen from 57% to 29%. Today, it stands at 15%. Similarly, confidence in bin Laden plummeted from 61% to 24% after the bombings, and by the time of his death just 13% of Jordanians had confidence in the terrorist leader. Pakistan is another example. The terrible violence Pakistanis have experienced at the hands of the Taliban and other groups over the past decade has led many to reject violent extremism. In 2004, 41% of Pakistani Muslims said suicide bombing can often or sometimes be justified; by 2014 only 3% held this view. In 2009, when the Taliban occupied Pakistan’s Swat Valley and threatened to drive even closer to the nation’s capital, Islamabad, opposition to the extremist group jumped dramatically. In 2008, just 33% of Pakistanis had an unfavorable view of the Taliban, but this rose to 70% in the 2009 survey. In Pakistan and elsewhere, once terrorist violence and extremist rule has become a reality, people have rejected it.